Fatma al-Kilani walks briskly into the room, gives it a quick glance, and locks her eyes on her son Saleh. She is mumbling a stream of barely intelligible words. Suddenly, she asks her son in a clear voice, “Saleh, did you find them?” When there is no answer, just an embarrassed, apologetic smile, she goes back to muttering and wandering around the house. She does not know how to sit still. Neither did her younger son, Ibrahim. Fatma al-Kilani, always searching or waiting for her son Ibrahim to return home. Here, she embraces her eldest, Saleh. 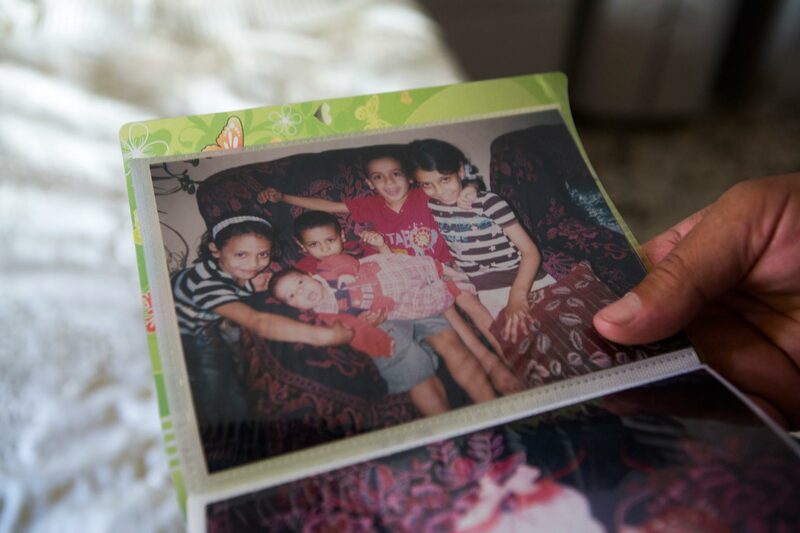 Life in Gaza has always been consumed by war, says Saleh, remembering his childhood. When the planes were flying over their heads back in the ‘60s, he and his friends used to run to the nearest orchard. The kids hid under the fruit trees, looking up to the sky through the leaves, and picked sweet figs straight from the lower branches while waiting for the planes to leave. But so much has changed since 1967, including the destructive powers of the Israeli airfleet, now armed with cutting-edge technology field-tested on Gazans. 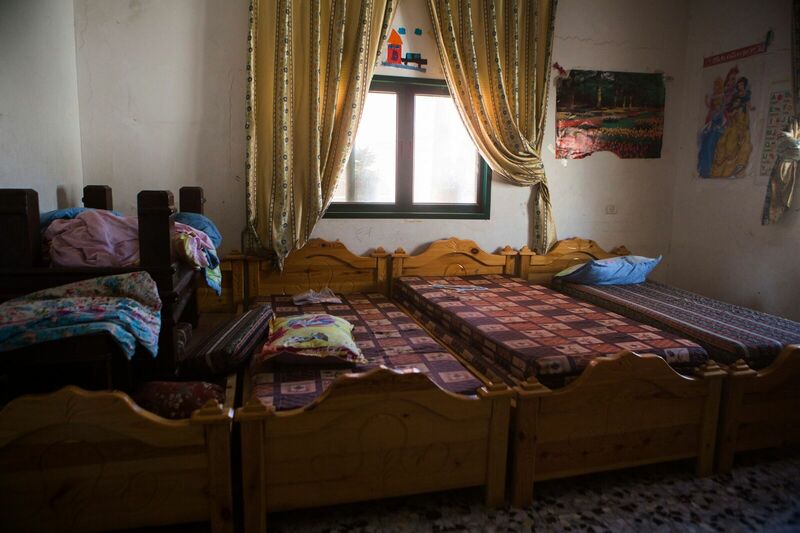 The fruit orchards that used to shelter kids in Beit Lahiya, the town in the northern Gaza Strip where the Kilani family lives, were replaced with tightly packed houses. The nearby cemetery, previously a site of sparsely scattered graves, has filled up with the tombs of entire families killed in the Israeli attacks during the 2014 war. Saleh passes by that cemetery quite often. Saleh visits the cemetery on his way to work. Before reaching the place where his family rests, he has to maneuver between the densely crammed up graves of many others, who were killed in summer 2014. “Ibrahim the architect” - the entire family is proud of his work. Here his brother is showing a building Ibrahim designed in Cologne. Ibrahim spent 20 years living in Germany, where he got his university degree and started a family with Kristina, a German woman. They had two kids: Ramsis and Layla. In 1995, when Ramsis was four and Layla two, they all went for a visit to Gaza. A few years later, Ibrahim and Kristina’s marriage broke down. Ibrahim moved back to Gaza on his own. At first it was difficult for him, he was depressed. But as time went by Ibrahim remarried with Taghrid and his newfound home life revived him. They had five little children: Elias, Yasser, Sawsan, Yassin and Rim. Still, he missed Ramsis and Layla. 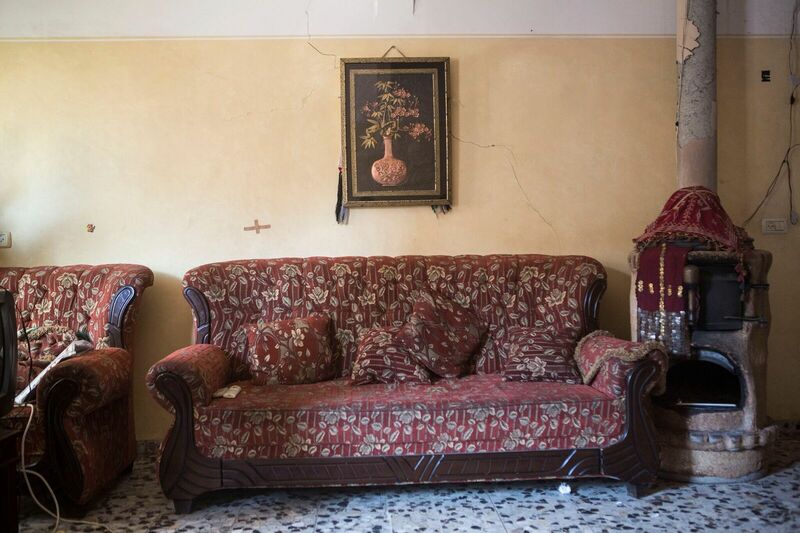 The family lived on the second floor above Ibrahim’s mother’s apartment. It was their childhood home, which had been expanded over the years to accommodate Ibrahim after his return from Germany. After returning to Gaza, Ibrahim married Taghrid. They had five children. Still, he missed Ramsis and Layla. 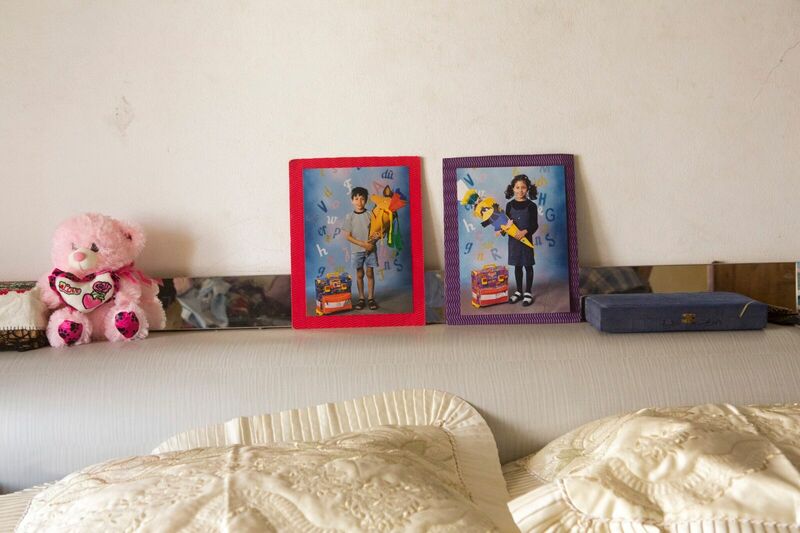 Their childhood photos took the honorary spot above the bedhead in Kilani's house. Ibrahim and Taghrid on their wedding day. They had five little kids: Yassin, Sawsan, Rim, Elias and Yasser. Once Ibrahim settled into his new/old life in the Gaza Strip, he tried to make up for the time he had spent away from his brothers and sisters. At night, after a long day of work, Saleh and Ibrahim would often sit together and talk. Sometimes it was at home, sometimes in the street or, their favourite in summer, at the beach. Wherever they sat, they would look around at the surrounding buildings and comment on what could have been done differently, how the design could have been improved, what would have been a more practical building solution. During those late night talks, the Kilani brothers often lost sense of time. 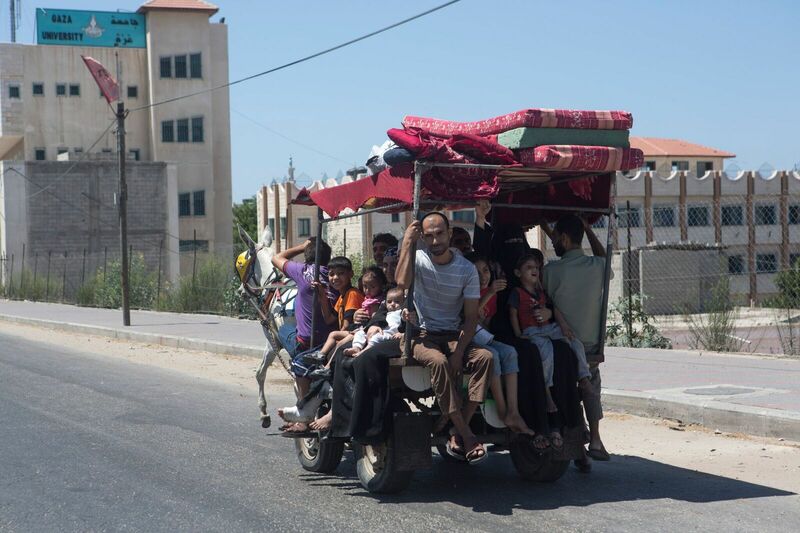 When the latest Israeli offensive started in summer 2014, most of the Kilanis decided to stay put in their homes. In mid-July, Israeli airplanes dropped leaflets in Beit Lahiya ordering people to evacuate towards Gaza City. The army was planning heavy bombing of the area. The Kilani family was part of the roughly 100,000 Palestinians living in the north of the Gaza Strip who were being instructed to leave. Ibrahim, Taghrid and their kids left, while everyone else stayed. 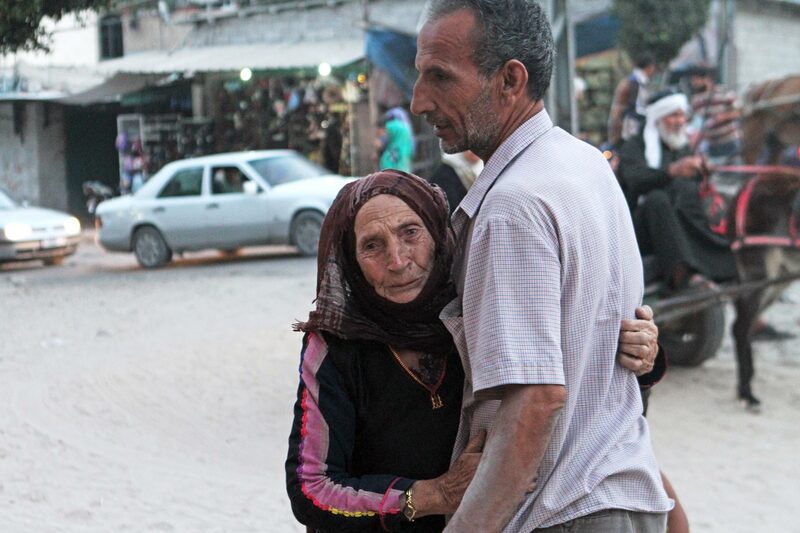 Fatma and Saleh, who lived just five minutes away, tried in vain to dissuade Ibrahim. 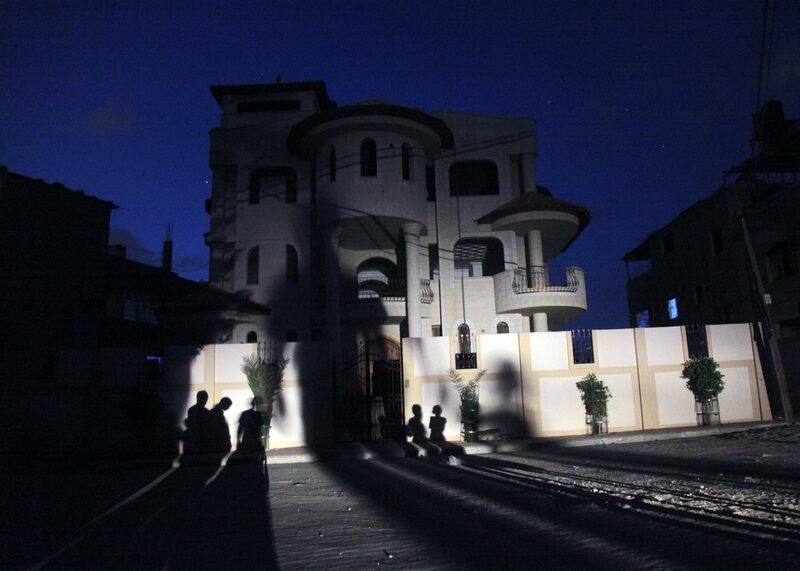 They went to Taghrid’s family the Dirbas, in Shuja’iyya, a neighborhood in the east of Gaza City – hoping it would be safer. However, the night the Kilanis came the area was anything but safe. 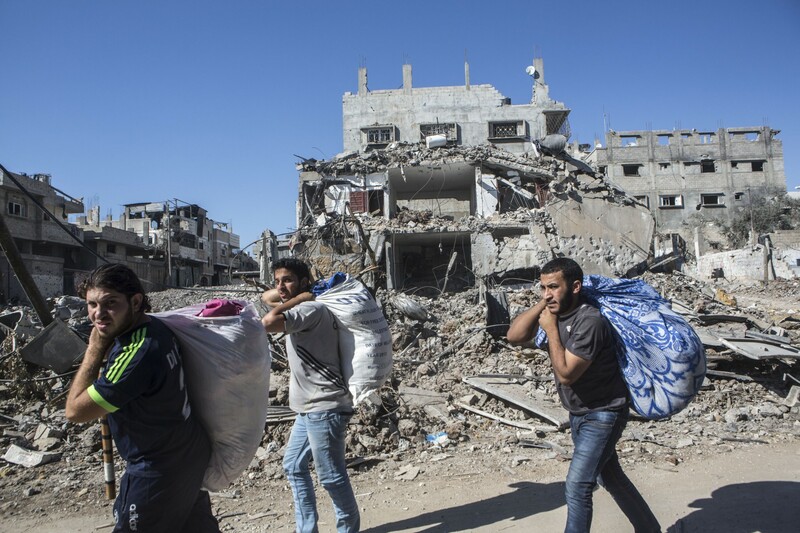 The Israeli military dropped a hundred 1t bombs and bombarded the area with 7,000 rounds of artillery. 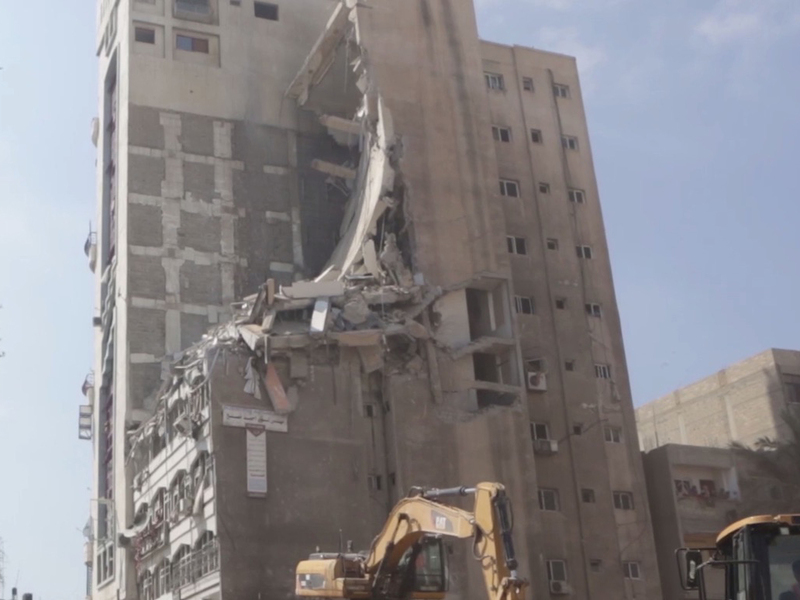 Most of Shuja’iyya was flattened; dozens of people were killed, hundreds injured. After one night there Ibrahim and Taghrid had no choice but to move their family again, as did the Dirbas, who decided to divide themselves into smaller groups. Taghrid’s three sisters Aida, Inas and Soura, and their newlywed brother Mahmoud, all went with the Kilanis. Once all the UN schools turned temporary shelters had filled up, people fleeing Shuja'iyya camped for weeks in the rear garden of the main hospital in the Gaza Strip. 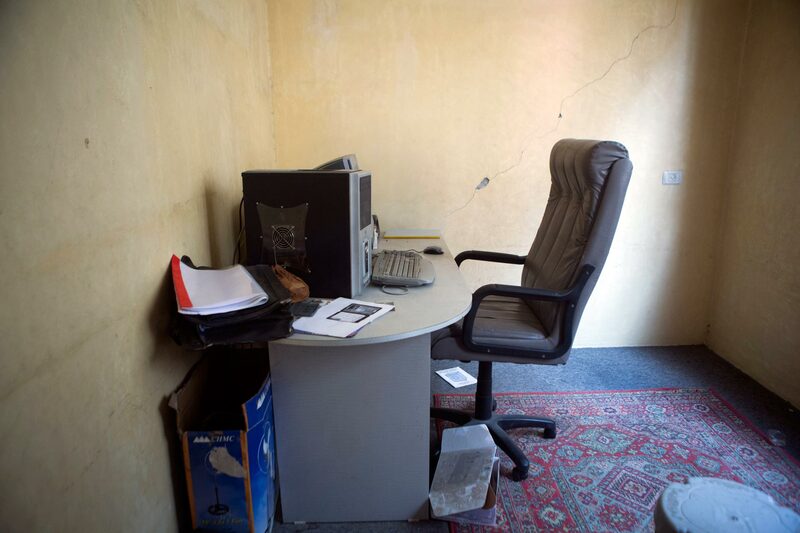 Ibrahim’s friend offered them a place to stay at the office of an engineering cooperative, in a tower in the centre of Gaza. There had already been other families staying in the offices. The UNRWA schools that served as temporary shelters for displaced Palestinians were filled up, so those fleeing Shujai’yya took shelter in the parks, churches, hospital grounds, grocery stores, offices and workshops; roof or no roof, as long as they were away from the eastern edges of the Strip. 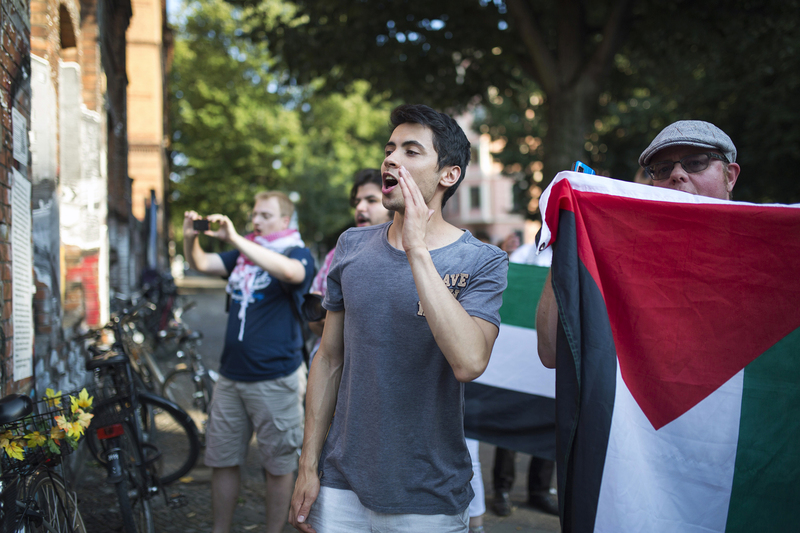 On Sunday afternoon, once they had settled into the engineer’s office, Ibrahim called his family in Germany. 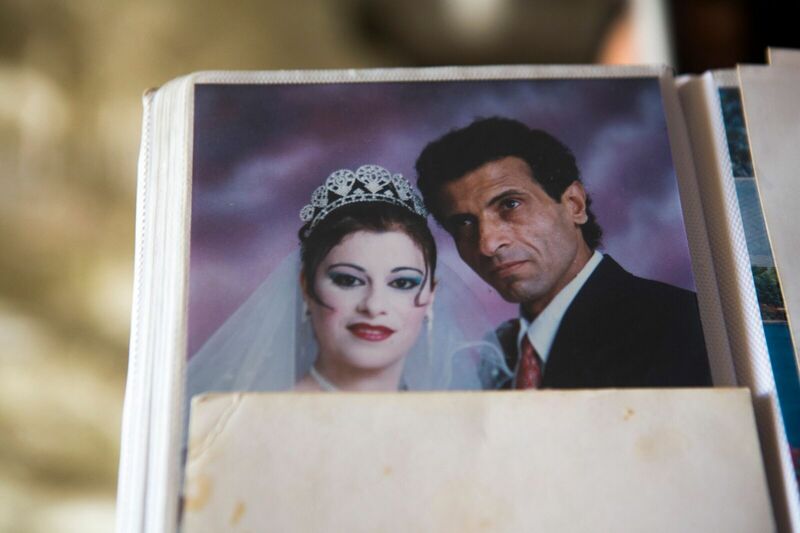 Months later, when remembering this conversation, Ramsis said his father’s dark sense of humor, a typically Palestinian way of dealing with the harshness of reality, made it hard to decipher how serious things actually were. It had been so many years since they last saw each other; it must have been hard for him to even imagine his father’s expression. “We are safe, finally. 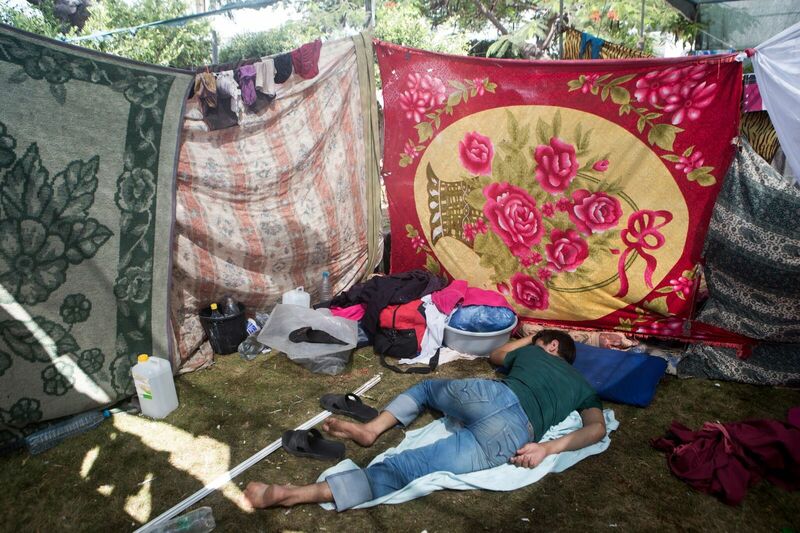 Don’t worry, this is routine for us,” Ibrahim said, leaving Ramsis at a loss, scared and helpless. A year after she lost her son, daughter-in-law and five grandchildren, Fatma comes out of the house, a tiny 88-year old woman, her face weathered by years of hard work. Fatma’s great-grandson, 2-year old Yamen, climbs into a red jeep parked in front of her home. Yamen’s uncle, Ibrahim, would drive all the kids to the beach in that jeep. She caresses the car, wants to kiss it. 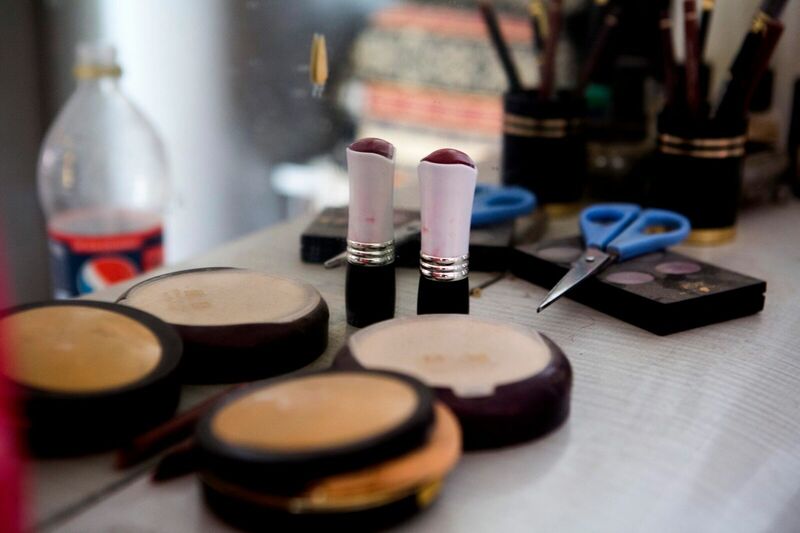 She wants to kiss every single item belonging to Ibrahim, his wife and their kids. Her children, seeing her pain, locked the door to the apartment upstairs. For months no one dared to touch anything there. 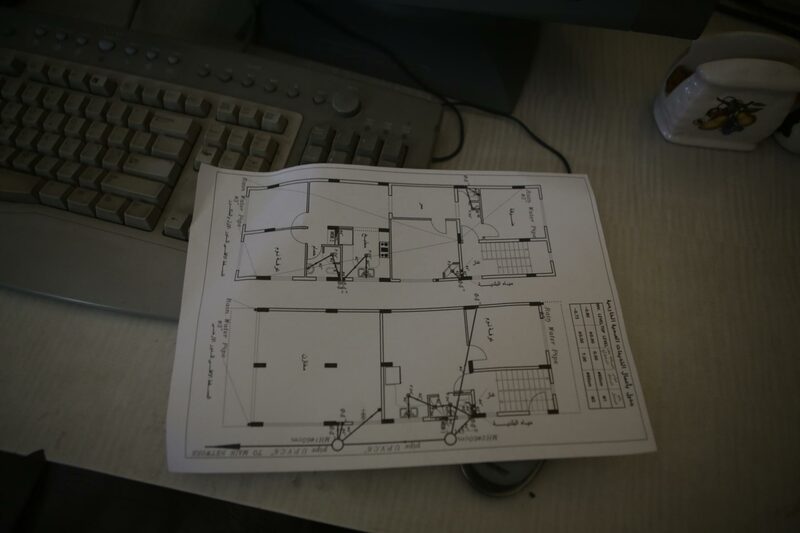 In the first months after the killing of Ibrahim's family, their apartment remained untouched. 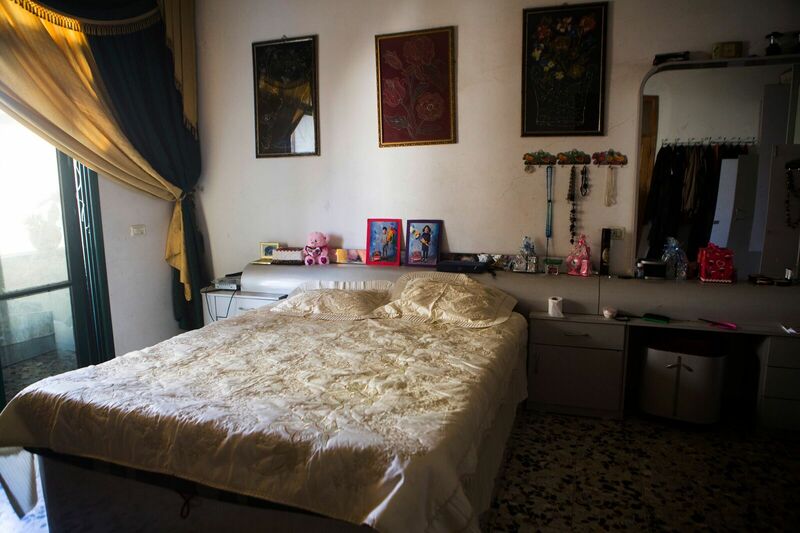 Except for Fatma, who used to come upstairs to kiss and caress the items that belonged to those killed. Troubled by her suffering, Saleh and Khadija locked the place up. A year later, all the belongings of the family were gone. Just a thick layer of dust in a nearly empty house. But now, a year after life disappeared from that house, a year since anyone has heard children’s laughter from upstairs, everything in the apartment is covered with a layer of dust. Taghrid’s wardrobe, once filled up to the brim with her colourful dresses, now houses just a lonely spider and its web. The photos of Layla and Ramsis that once took the central spot over Ibrahim and Taghrid’s bedhead are gone. The garden planted by Ibrahim on the rooftop, once lavish and green, has become a sad sight of withered pot plants, the only survivors being cactuses. “He loved manual work; he enjoyed creating new things and showing them off to his family,” remembers Saleh, looking at the dead plants. Another piece of Ibrahim’s handiwork, a mud oven, stands in the middle of the now empty living room. “In winter, Ibrahim used to fire it up, bake meat in it and call the whole family over to eat together and enjoy the warmth spreading through the house,” Saleh explains, leaning against the dusty indoor tabun. On the living room wall, the Kilanis used to have a poster with the photos of those who were killed. 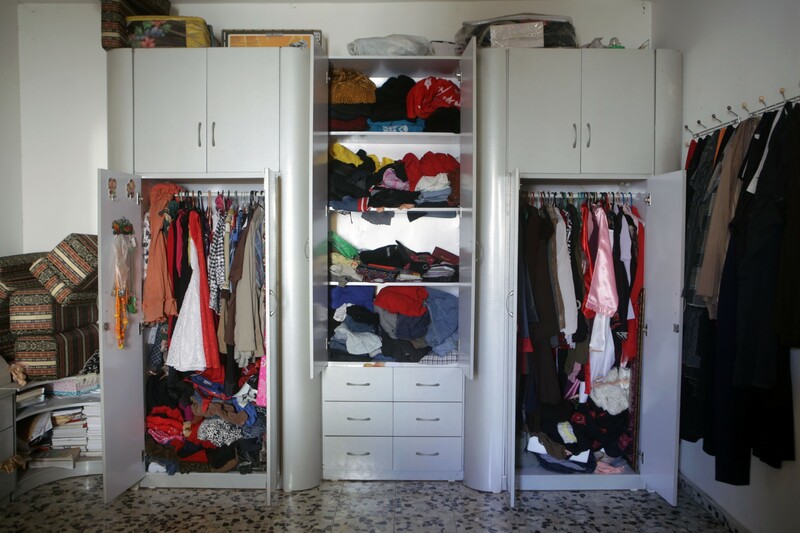 It is a tradition here, and a common sight in Palestinian homes. But now the poster is hidden behind a closet. Saleh takes it out for a minute. “My mother could not stand to see it,” he explains, and puts it back before she returns. 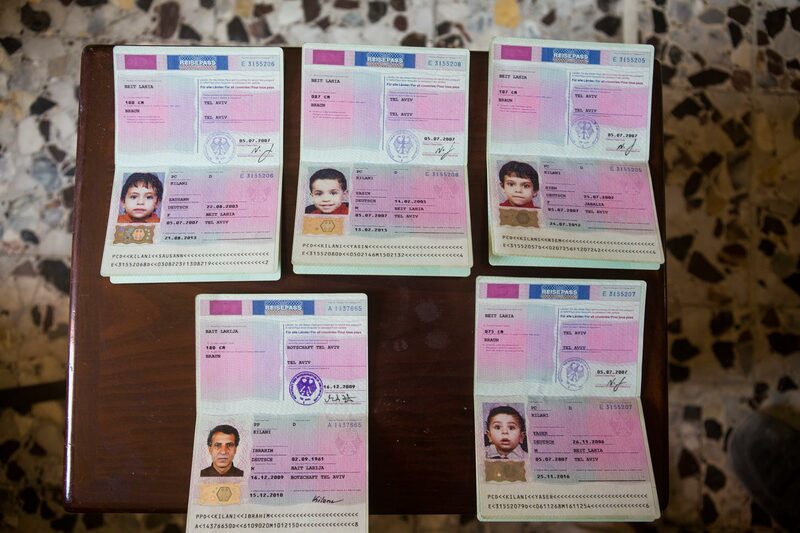 Ibrahim and all his children were German citizens. 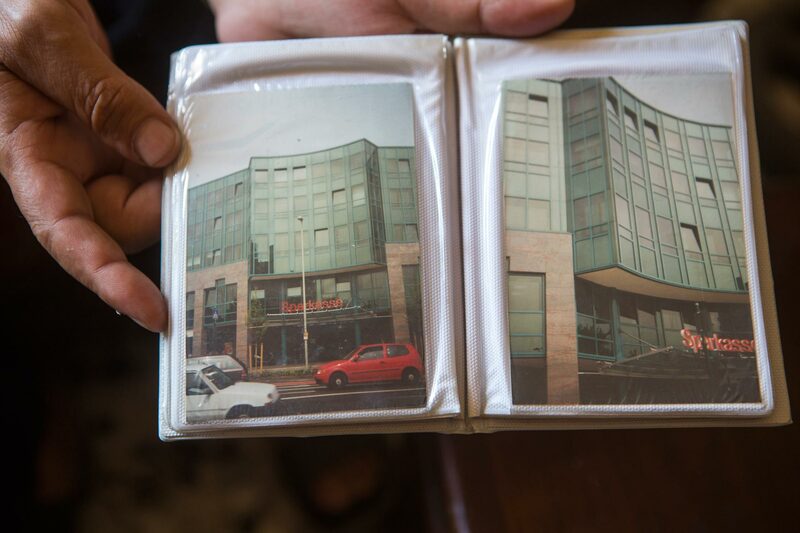 These are their German passports, found days later in the rubble of the bombed tower. 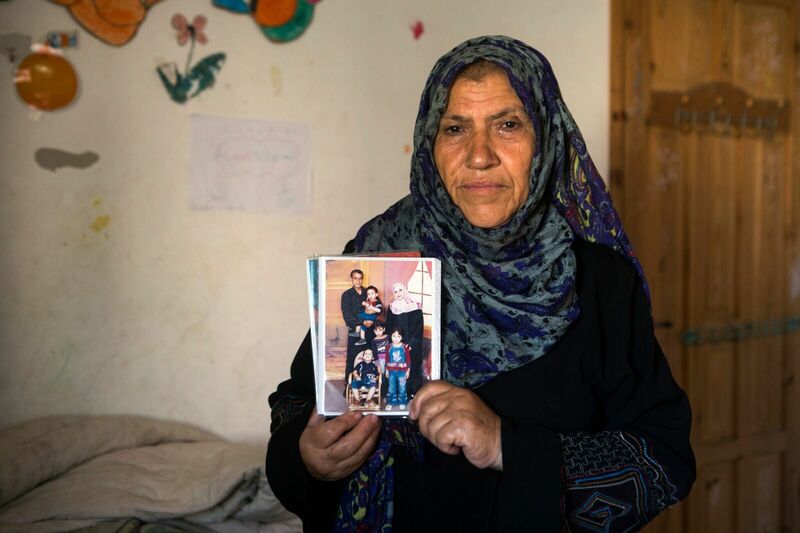 Khadija, Ibrahim's sister, holds photo of her brother and his family.